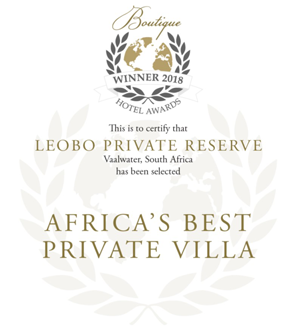 Leobo Private Reserve is a 20,000 acre estate within the beautiful Waterberg mountains, 3 hours drive north of Johannesburg. It is home to the award winning Observatory Private Villa, one of the most exceptional safari houses in Africa, not only from an architectural and style perspective, but also as an experience. At Leobo, things are done a little differently. Our accommodation is rented exclusively to one group at a time and guests are made to feel completely at home, indulging in as much of everything on offer as they please. There are no daily programs or time restrictions; guests are entertained by the team of staff as friends of the owner, and activities seamlessly blend in to one another until you have done so much more than you ever imagined possible. Owned by an English couple with a huge imagination, sense of adventure, 6 children of their own, and a sense of humour, Leobo delivers a completely unique African experience. Call it the Apres Safari if you like. We believe in more than game drives, and we’ll give you a once in a lifetime experience that you’ll be talking about for years to come. You don’t need to be adventurous or an adrenalin junkie, just a family or a bunch of friends who believe in enjoying themselves and value quality time together in a private setting. Cool, breathable clothes are advisable for the summer months. During the winter months (May to September), warm clothes are essential. Comfortable walking shoes, sun hats, sunglasses, sunscreen/block, cameras and binoculars.